Recent research has investigated how adaptive emotion regulation (ER) strategies and maladaptive ER strategies interact to predict symptoms, but little is known about how specific strategies interact with one another when used in daily life. The present investigation used daily diary data collected over two weeks from an unselected student sample (N = 109) to examine how reappraisal, a putatively adaptive ER strategy, interacts on a given occasion (within-person) and across occasions (between-person) with putatively maladaptive ER strategies (rumination, experiential avoidance, expressive suppression) to predict daily depression and social anxiety symptoms. 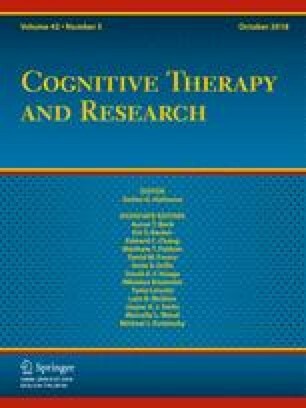 Results revealed between-person interactions of reappraisal with rumination and experiential avoidance, wherein reappraisal was most negatively related to symptoms for individuals who frequently used rumination and experiential avoidance. There was a similar within-person interaction between reappraisal and expressive suppression. Implications for assessing daily and retrospective ER are discussed, as well as future directions for studying ER in daily life. The online version of this article ( https://doi.org/10.1007/s10608-018-9913-x) contains supplementary material, which is available to authorized users. We are grateful to John Roberts for his helpful feedback on previous drafts of this manuscript. Tierney P. McMahon and Kristin Naragon-Gainey declares that they have no conflict of interest.